Excerpted from Do Unto Animals by Tracey Stewart (Artisan Books). Copyright © 2015. Illustrations by Lisel Ashlock. Talkative as my kids are, however, there is a family tradition that silences them for the longest interval of the year, and that is The Great Backyard Bird Count, an annual event held by the Audubon Society each February. The event lasts four days, during which individual bird-watchers spend at least fifteen minutes a day counting birds in as many places as they can and making their best estimate of how many of each species they’ve seen. At the end of the event, participants submit their findings, and the results go toward helping researchers collect data and learn more about bird populations. Armed with field guides and notebooks, we head out into the woods to be scientists. I love telling my kids that animals in the woods can hear us coming from miles away, and that they’re not going to relax and start going about their usual business unless we can find a spot where we will be comfortable staying for fifteen minutes without making a peep. It works like a charm and is probably the closest we’ll ever get to a family meditation. In shared silence, we delight in spying the brightly colored common yellowthroat warbler, the adorable Carolina chickadee, and the regal snowy egret. 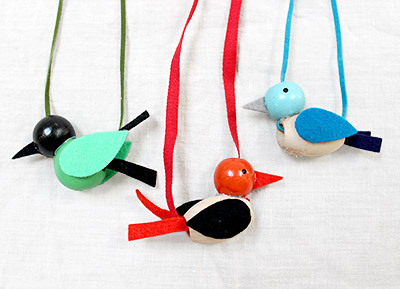 Our craft contributor, Jodi Levine, created these bird necklaces to help us celebrate the different colored birds we can spot when we bird watch. Learn some tips for bird watching on Pages 110 & 111 of Do Unto Animals and then make some bird necklaces of your own with the information you've gathered. 1. CUT the ribbon to the desired length of your necklace. 2. THREAD one oval shaped bead onto your ribbon, followed by a round shaped bead. 3. SLIDE both beads onto the ribbon and ARRANGE the round bead to sit on top of the oval bead. Keep the round bead close to the edge of the oval bead. The hole on the round bead should be facing vertically and the hole on the oval bead should be facing horizontally. 4. GLUE the beads together. Be sure that the ribbon feeds through one side of the oval bead and out through the top of the round bead. 5. 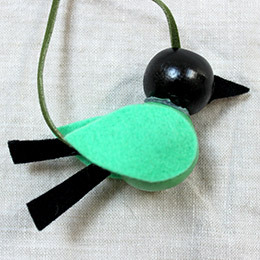 CUT tear-shaped wings for your bird out of colored felt. 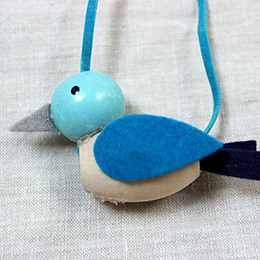 CUT thin rectangle-shaped felt pieces for the tail of your bird. CUT a triangle-shaped beak for your bird out of colored felt. 6. 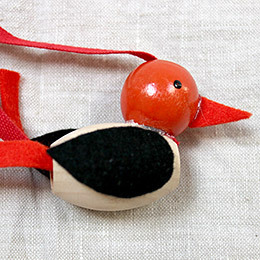 GLUE all felt pieces to your bird and DRAW two small dots as eyes using your black maker. Controlling our backyard insects and indoor nightmares. Learn how to arrange the perfect floral centerpiece.